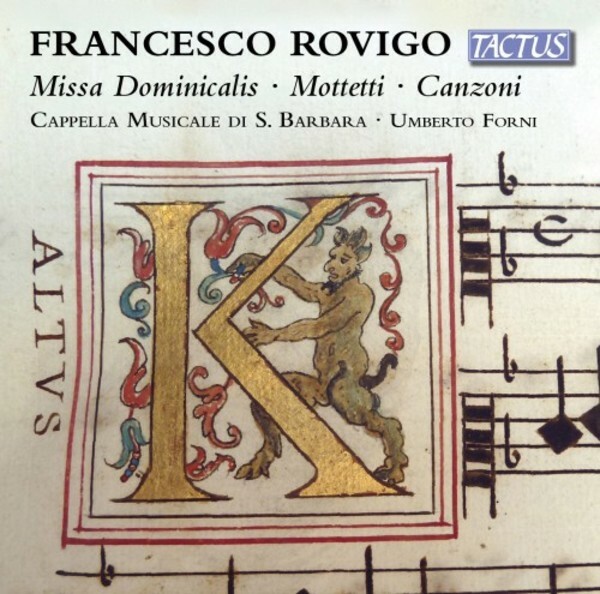 Towards the end of the sixteenth century, at the court of the Gonzagas, the young organist Francesco Rovigo was appreciated to the point of being sent by the Duke Wilhelm to study in Venice with Claudio Merulo, the greatest master of his time. After hosting Francesco Rovigo at his court, and despite the insistence of the Gonzagas, the Archduke Charles of Bavaria would not let him return to Mantua and held him, granting him a big honorarium until his death in 1590, when he returned to Mantua Rovigo. These events give us the clear idea of the calibre of this musician, for which even Claudio Monteverdi himself expressed words of the highest consideration. The live recording of this concert brings to light what is left of his music in the archives of the Palatine Basilica of Santa Barbara in Mantua, where Rovigo was appointed kapellmeister and where now he lies buried alongside the great Flemish master Giaches de Wert, his predecessor.